Since the mid-1990s, Richard N. Winfield has led the Media Law Working Group, dedicated to assisting reforms of media laws and policies. In 2000, he became one of the co-founders of the International Senior Lawyers Project, which now sponsors the Working Group’s global pro bono activities. He regularly teaches comparative mass media law at Columbia Law School, and U.S. mass media and Internet law at Fordham Law School. For over three decades he served as of general counsel for the Associated Press while a partner in Roger & Wells, which became Clifford Chance US LLP. He defended journalists and news organizations in the US and abroad in hundreds of litigations. His articles have been published in the Journal of International Media and Entertainment Law, Communications Lawyer, and other legal publications. His Media Law Working Group missions have taken him to over twenty countries. 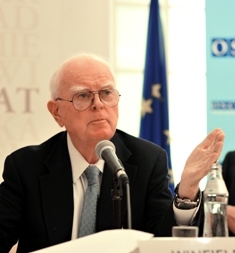 Mr. Winfield served as Chairman of the World Press Freedom Committee and Chairman of the Fund for Peace; presently he is a trustee of the Freedom House and Treasurer and board member of the International Senior Lawyers Project. He served in the U.S. Navy for four years and taught modern European history and American diplomatic history at the U.S. Naval Academy. He holds a B.A. from Villanova University and a J.D. from Georgetown University’s Law School.